Everyone talks about networks, and the power that they have – and we offer high impact workshops and classes on how to build and maintain an effective network that will make a difference. Sloan Fellows always say how important it was to meet people from so many different backgrounds, and whilst the business connections are strong, the friendships bring real value for years. The Sloan Summit bought together a phenomenal group of alumni – including those from MIT and Stanford for a one-day event hosted at LBS. This is a true highlight of the Sloan Fellowship, with speakers drawn from faculty, alumni and Stanford, MIT and LBS Directors discussing the future the workplace and of Sloan. Here is a video from the day – you can almost feel the close connections. Of course you don’t have to wait for the Sloan Summit or Reunion to come back to LBS. We often grab a coffee with Sloan Fellows dropping in – it’s a great chance to hear about what’s new. Catching up with alumnus Vinay Kulkarni (LBS Sloan 2005) it was great to hear about his corporate leadership challenges and achievements over the years. It was even more interesting to listen to him talk about his non-profit activities – connecting with his passions and finding ways to make a real contribution. In Vinay’s case, the passion is for vision restoration. He now lives in India and is actively involved as a volunteer in the field of treatable blindness in general and corneal blindness in particular. He mentors, advises and supports a few organisations working in this field who strongly believe that every visually blind person whose vision can be restored should have access to help and treatment. His experience is invaluable. 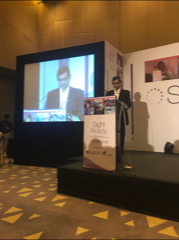 Here he is delivering a speech at the SightReady conference last year in New Delhi. As you plan your application, remember that the LBS Sloan can be a wonderful platform for achieving personal goals you dream of, as well as career goals. Sloan Fellows make a difference in their work and create a legacy. If you want to kick-start the research process, we have a number of channels to support you in your choices, including one-to-one coffee chats, class visits and CV reviews to discuss your background and goals. Contact our recruitment team to find out more.